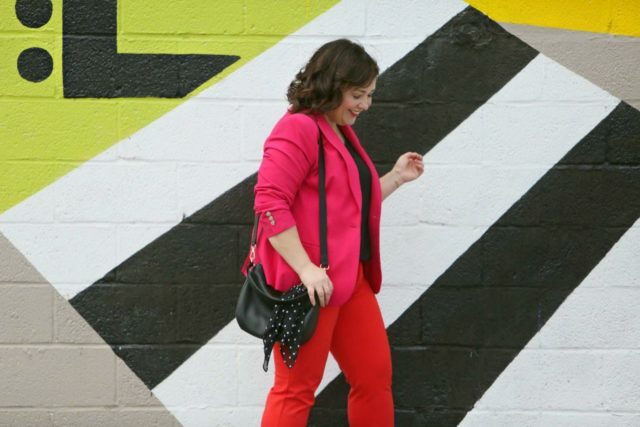 There's some color combinations I just adore, and I love when they come back in style. 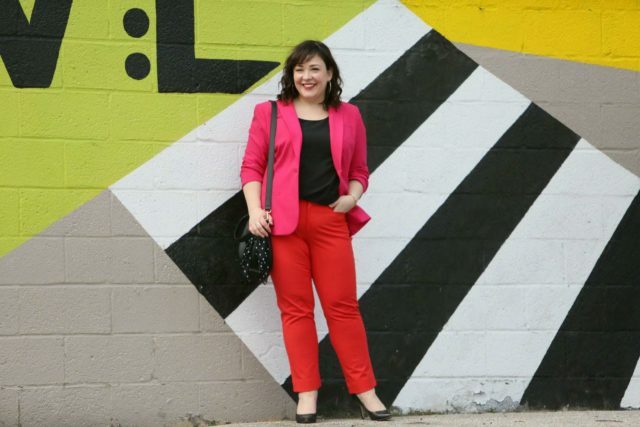 Red with pink is a hot trend and one I've worn for years (see here and here). 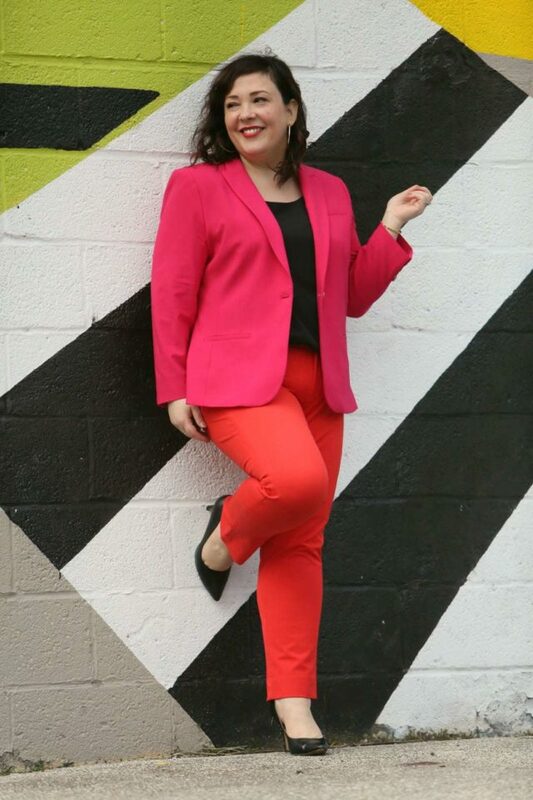 This is the same pink blazer from this blog post; I saw these pants on clearance at Banana Republic and thought they'd be great to wear with striped tees, silk blouses, denim jackets, and more. 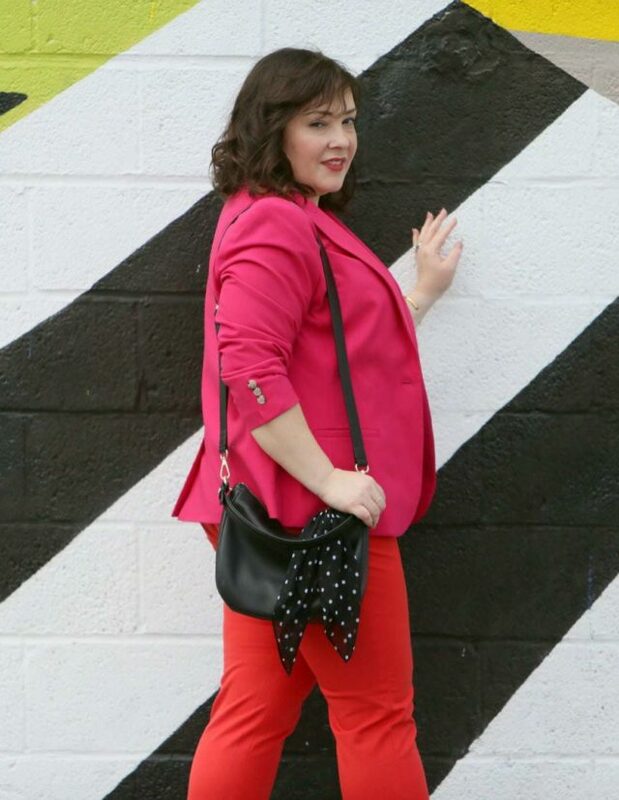 I was psyched to see they worked so well with this blazer! To make it look a bit more polished, I styled them with a dressy black shell and black pumps. However, this combo could work great with a message tee and pair of trendy sneakers, a Breton top and oxfords, or glam it up with strappy heels and a satin camisole. 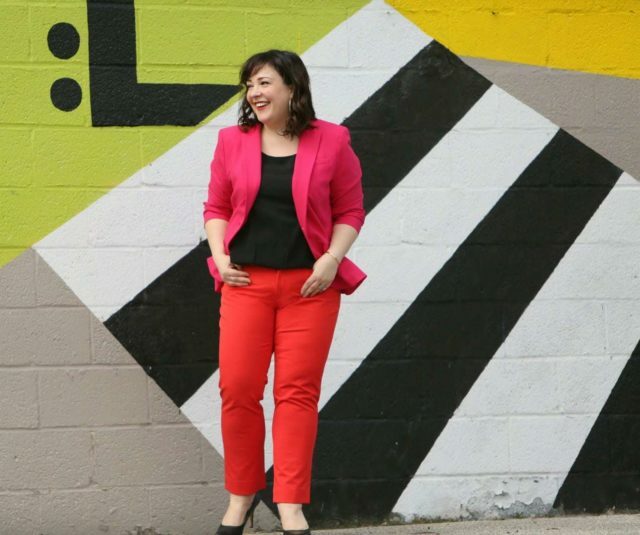 It's easy to choose neutrals for blazers and pants, but sometimes a statement color can be more versatile (and well a lot more fun to wear!). It’s a little like wearing Navy Blue with Black. I think it’s good, both colors are deep toned. I think the accessory or top you wear is important and should help signal that you didn’t get dressed in a dim room and grab pants/jacket that you thought matched. So a pin, scarf, top that accentuates the deliberate nature of your color choice seems good. I hate to say it, as I usually like your outfits, but this one isn’t working. The colors are too similar, so it makes it look as if you got dressed in the dark. Love that combination! Chic and effortless. I’m still curious about the Chili Bowl restaurant. What is chili half-smoke? Since it’s eaten like a hot dog, you eat it with chili, cheese, onion, etc. Ben’s Chili Bowl in DC is probably the most famous purveyor of a half smoke with chili. I love this combo on you; it’s a daring duo. If I was a few years younger, I’d give it a go. These are the best photos of you with a back drop. They are ART. It is so POW. Thank you! It’s been fun collaborating with Karl for good backdrops for each outfit! WOW! The outfits are terrific, and the photographs magnificent. You look chic, happy, full of confidence and energy. What a great way to break up that suit Allie!!! And this color combination is the perfect way to usher in spring!!! I’m totally inspired! !